Hoping to throw the perfect first birthday party for your little one? 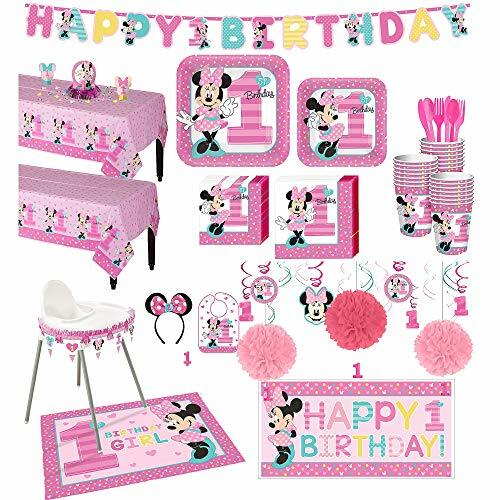 The 1st Birthday Minnie Mouse Deluxe Party Kit for 32 Guests will help you do just that. Let the little one enjoy her own Minnie Mouse Ears headband, and decorate her high chair with the included decorating kit. Use the birthday candle for her first birthday cake. Next, hang the swirl decorations and glitter cutouts to add a sense of magic and wonder to the party scene. With 32 lunch plates, 32 dessert plates, 32 lunch napkins, 32 beverage napkins, and 32 paper cups, this kit has all the items needed for the special day. This set also comes with 210 pieces of bright pink plastic cutlery (70 forks, 70 spoons, and 70 knives) so guests can enjoy all their favorite foods and snacks. Complete the little girl's birthday party theme with the 2 table covers, 3 banners, and 23 piece table decorating kit. The kit includes a large centerpiece with Minnie Mouse in a pink dress with a "Look Who's 1" headline surrounded by pink number "1"s. Warning: Not for children under 1 year. 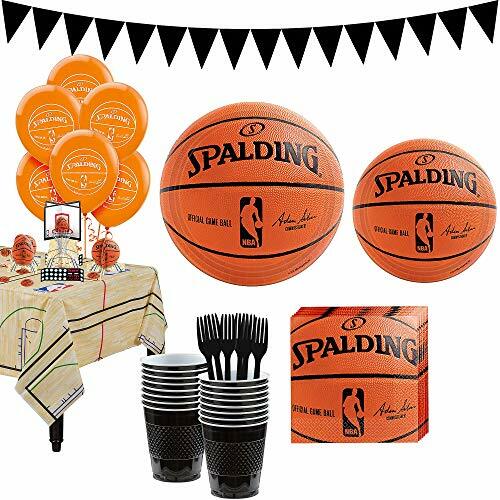 Indulge your ultimate NBA fan when you host the next game with the Super Spalding Party Kit for 18 Guests. Everything you need to serve the whole gang refreshments and much more. The 18 lunch plates, 18 dessert plates and the 36 beverage napkins have the image of a Spalding official NBA basketball. Set includes 20 black plastic 12oz cups with a non slip grip and 20 black premium plastic forks. Serve it all on the officially licensed NBA plastic tablecloth with a repeating basketball court pattern. Hang the 12ft banner with Spalding basketball pennants. Blow up the 6 Spalding latex balloons and tie them off with the 40 feet of iridescent white curling ribbon. 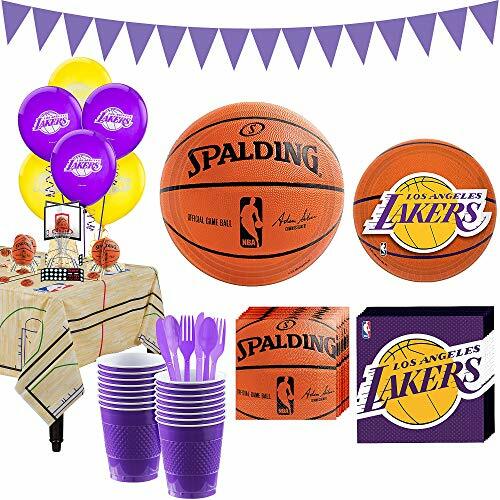 Set out the 3D cardstock centerpieces and the table scatter featuring official Spalding basketballs. Show them all you are ready to play! Balloons arrive uninflated. WARNING: CHOKING HAZARD - Children under 8 years can choke or suffocate on uninflated or broken balloons. Adult supervision required. Keep uninflated balloons from children. Discard broken balloons at once. Balloons contain natural latex rubber, which may cause allergic reactions. Warning: Cups not suitable for boiling hot liquids or microwave use. Cutlery not suitable for microwave or dishwasher use. Send them off in colorful style with a Happy Retirement Celebration Party Kit for 32 Guests. 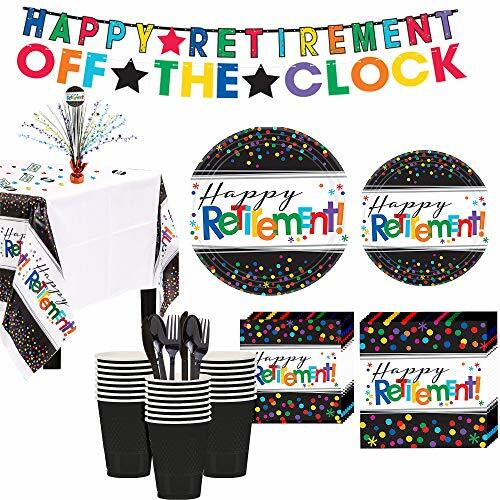 This all-in-one party kit has everything you need to create a memorable retirement party room, featuring "Happy Retirement" messages and colorful polka dots on a black background. The plastic table cover has a festive border and white center, so the matching tableware can take center stage. Serve a meal and sweet treats with paper plates and napkins featuring a "Happy Retirement" message in 2 convenient sizes. Serve up cold party beverages in the matching black plastic cups, and complete place settings with black premium plastic utensil sets. Be sure your party room matches your table with a sparkling spray centerpiece and 3 designs of cardstock and foil confetti. Finally, wish them a fond farewell with 2 banners that read "Happy Retirement" and "Off the Clock." Hoping to throw the perfect first birthday party for your little one? 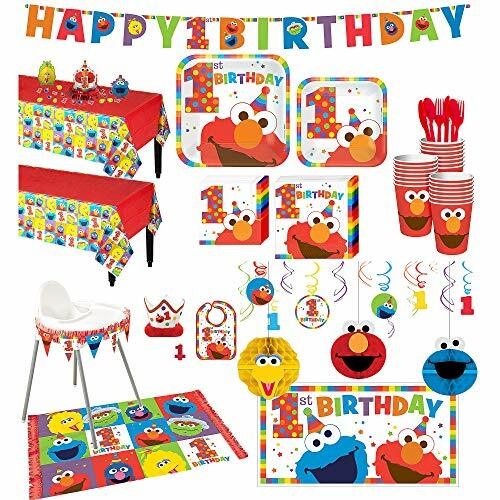 The 1st Birthday Elmo Deluxe Party Kit for 32 Guests will help you do just that. Let the little one enjoy wearing the Elmo crown, and decorate the high chair with the included decorating kit. Use the birthday candle for the first birthday cake. Next, hang the honeycomb and swirl decorations to add a sense of magic and wonder to the party scene. With 32 lunch plates, 32 dessert plates, 32 lunch napkins, 32 beverage napkins, and 32 paper cups, this kit has all the items needed for the special day. This set also comes with 210 pieces of red plastic cutlery (70 forks, 70 spoons, and 70 knives) so guests can enjoy all their favorite foods and snacks. Complete the little one's birthday party theme with the 2 table covers, 2 banners, and 23 piece table decorating kit. The kit includes a large centerpiece with Elmo in a party hat surrounded by number "1"s with and metallic red trim at the bottom. Then, add the other two smaller centerpieces. One features Big Bird, and the other features Cookie Monster. Warning: Not for children under 1 year. A life of crime looks more glamorous in the movies, with images of well-dressed men ganging together in a cunning, meticulous schemes; and if looks could kill, these stunning black fedoras would pack the heat! Whether you're after mobster make-believe or looking to form your own rat pack, our iconic stunning black fedoras will surely fit the bill. 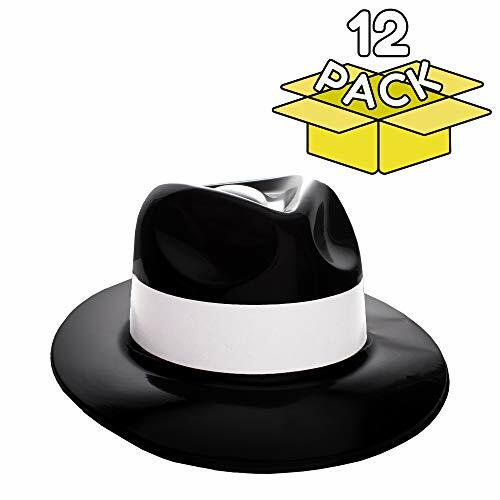 Our stylish fedoras feature an iconic design that's consistent with mobster chic, while adding a twist of colorful gloss to make their stunning black color scheme shine; constructed of thin, pliable plastic, these fedoras (12 included) stack compactly, providing effortlessly storage capabilities for theatrical costume closets, pre-planning for mobster themed costume parties, Halloween, and much, much more! Perfect for weddings, 50th birthday and anniversary celebrations, New Years Eve or anytime black fits your color scheme. This 12 pack is perfect for themed kids' birthday parties, Halloween and costume party caravans, theatrical productions, and more! INCLUDED: Twelve (12) stunning black fedoras. One size fits most. Hoping to throw the perfect baby shower for your little one? 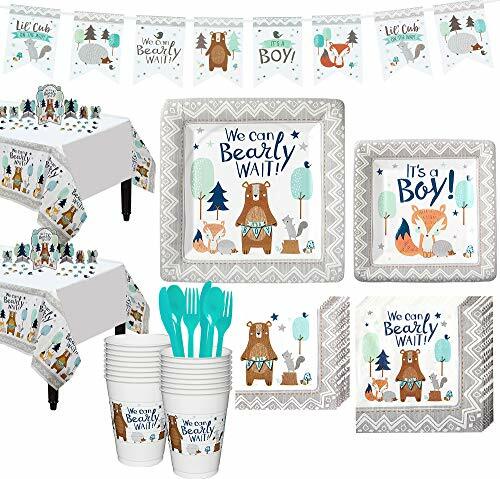 The Can Bearly Wait Baby Shower Kit for 16 Guests will help you do just that. With 16 lunch plates, 16 dessert plates, 16 lunch napkins, 16 beverage napkins, and 25 plastic cups, this kit has all the items needed for the special day. This set also comes with 48 pieces of Robin's Egg Blue plastic cutlery (16 forks, 16 spoons, and 16 knives) so guests can enjoy all their favorite foods and snacks. Complete the little cub's party by hanging the pennant banner. Add the table centerpieces and table scatter for the final touch. 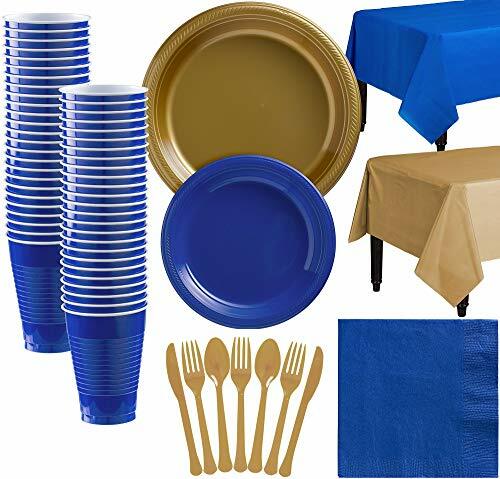 Whether you're celebrating a graduation, game day, a birthday, a holiday or another great milestone, the Gold and Royal Blue Plastic Tableware Kit for 50 Guests has got you covered! First, lay the foundation for a wonderful feast with 2 plastic table covers, ideal for banquet tables. Next, serve your meal and dessert on sturdy plastic plates in 2 sizes. Keep your guests and your party room clean with square paper napkins. For cold party drinks, the kit includes plastic cups that feature a convenient ribbed texture and a generous 12-ounce capacity. Finally, finish off your tablescape with plastic utensil sets, which include forks, knives, and spoons. 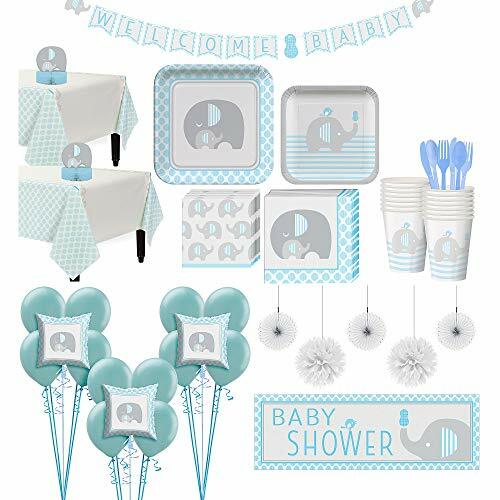 No need to stress over throwing a memorable and fun baby shower. 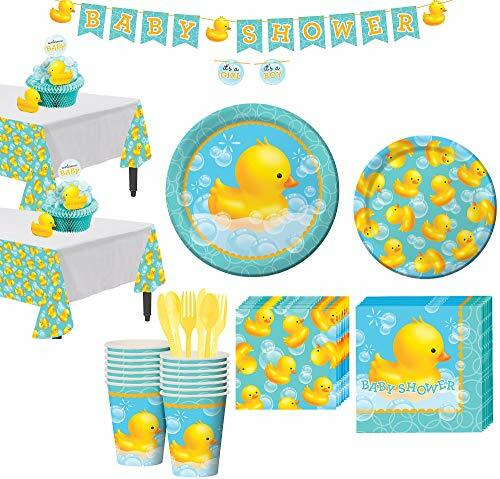 This Rubber Ducky Baby Shower Tableware Kit for 16 Guests will help you do just that. With 16 lunch plates, 16 dessert plates, 16 lunch napkins, 16 beverage napkins, and 16 paper cups, this kit has all the items needed for the special day. This set also comes with 2 sets of yellow plastic cutlery (16 forks, 16 spoons, and 16 knives) so guests can enjoy all their favorite foods and snacks. Complete the baby shower party theme with the 2 table covers, the banner, and the honeycomb table centerpiece. Warming Foil Hot Dog Wrapper Sleeves 50 Pack by Avant Grub. Turn a Party into a Carnival with Classic HotDog Bags that Keep Dogs Warm and Fundraiser or Concession Stand Guests Mess-Free!